Fitting in my run today was looking a bit challenging. I didn't want to bail on the run at all. Actually, I felt this urgency to get the run in tonight because I really want to rest a full 2 days before Reach the Beach. I had 3 miles scheduled for today, so the time commitment wasn't a problem at all - it was fitting it in with weird work schedules, chiropractor appointment and Ward's soccer game. I haven't mastered taking pictures and running! I am quite happy with myself that I did get the run in AND I got to spend time with the kids all at the same time! Yes, I brought them both with me. Tucker on his bike and Izzy in the jogger. I thought it was quite a bit of fun having both kids with me. Izzy loved watching her brother fly by us and then duck behind him and then repeat the entire scene all over again. Tucker loved entertaining his sister with something so incredibly simple. Win win for all of us! I really just pushed Izzy ahead of me a little to get this picture! Good luck on your RTB adventure! Great job fitting it into to your schedule! I know as the kids get old they will have a schedule to go around. I'm going to enjoy these schedule free years! Excited to hear about Reach The Beach. Good for you for fitting it all in and having fun while doing it. When the schedule is tight, I usually will get my run in before the kids are up(5 a.m. baby!). If it's just a short run and time allows, I'll take them with me in the double stroller. Have a blast at Reach The Beach! I wish I was doing it this year but our 10 year anniversary is on Friday. I couldn't leave my hubby at home with the kids while I was running with a bunch of other people all day and night! I should have added that doing it early was not an option! The husband had to be at work at 4am (left the house at 3!). Normally I would have zero issues with getting up and have been at the gym by 4:30! I have to leave the house by 6:15 for my job. Bummer that you won't be at RTB but your anniversary is far more important! I don't bring my kids along, maybe when they get a little bigger, I used to use the double stroller but I really don't miss it. If things get tight and I can't find a babysitter I use my elliptical, not what I want all the time but better than nothing! Way to go! It just goes to show that where there's a will there's a way. 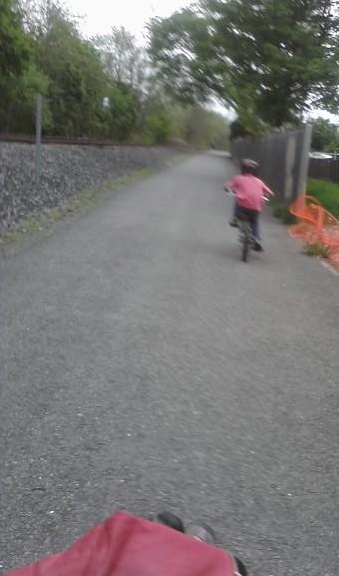 I love seeing moms down on our river trail system running with their kiddos riding alongside. Great job getting your run in! I am SO EXCITED for you for this weekend!! You are going to do great! It is so hard fitting everything in, but luckily we don't have kids. I do feel like Bernie gets neglected sometimes but we try to give him lots of kisses and love when we are home. The cats can fend for themselves, haha. Oh yes - cats can definitely fend for themselves!!! :) It is hard to find time to get the run/bike/workout in for sure kids or not. We just make it work. You're a super mom! Nice job! I think stroller running should have it's own race division too! :) Age groups and then strollers! Ha! 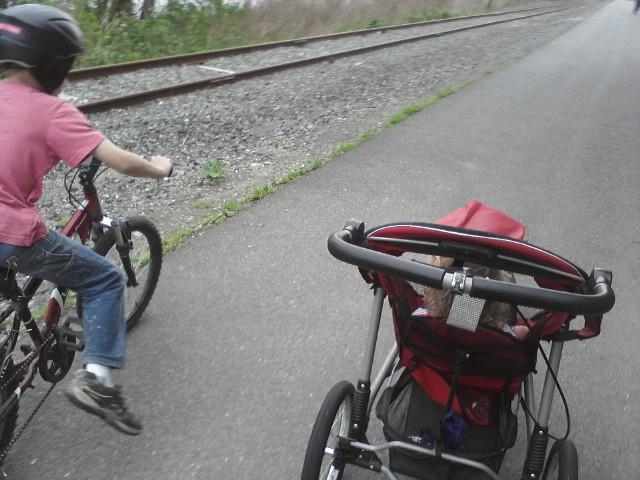 :) I do love stroller running but I've never had both kids with me before. Next thing you'll see me add in the dog too. I've managed to work my runs in during my lunch hour... if not, I'll get up around 430 and get it in before the house wakes up. Our daughter (7 months) is too young to join us, but once she is able, dad is gonna take her out for a run. Ha ha! I have to chuckle - lunch hour? What's that? I get 15 minutes (teacher here) to shove food in my mouth while checking emails! Normally when the schedule is tight like yesterday - I've been up and at the gym by 4:30 which is completely fine but the husband had to be at work at 4am (left at 3!). Jeez! I'm sure you'll have baby girl out with you as soon as you can! I'll let ya know when I get there!! LOL Right now it seems that even walking hurts. I am carrying REALLY low so my normal walk pace, I start getting cramps. So I have kept it on the DL with walking. I can't wait until I can get back into it though! !